No doubt about it, Michael Jackson died as he lived: with an unbelievable scrum running slightly behind. And while his untimely demise may have been broken by the new likes of Twitter and TMZ, the pros quickly moved in to smother the bones. That included some friends of mine. Malkoff, Frank, Browning, Orozco, Busse ... they and hundreds of their closest competitors ended the week over Jackson''s Hollywood star - just in case he arose with dancing zombies in tow. So far they're a no-show, but it didn't stop a posse of photogs and fanatics from forming where usually only tourists dare to tread. Size-wise, L.A. hasn't seen this kind of pile-on since O.J. Simpson got away with murder. How long the chattering classes will stand watch over this less than sacred sidewalk remains unknown, but one thing is for sure. As long as A-List celebrities die in scandalous manners, the Fourth Estate will roll up late and gesticulate. Handing down a passion is tricky business, but James V. "Smiling Jimmy" Pergola seemed to do it with ease. Maybe that's because the famed Pathe News cameraman was so consumed himself. From the Lindbergh baby’s kidnapping to the the Detroit auto strikes to the Cuban revolution, this son of Italian immigrants dragged his glass through every sensation the dirty Thirties had to offer. Along the way he gained a reputation as a fierce but fair competitor, one who wasn't above bringing his boy to work. Sadly that tutelage was cut short when the legendary lenslinger boarded a United Airlines flight to do a story on the safety of Transcontinental flight. A powerful blizzard forced the plane off course; it crashed into Utah's Hayden Peak and Pergola perished with the rest of the passengers and crew. 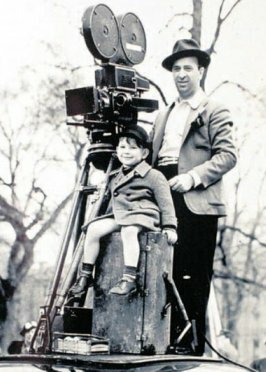 Still, his words of wisdom weren't lost on his son James, who grew up to enjoy a 45 year career as a cameraman on feature films and television. But don't take my word for it. Hear it from the grown up son - who spells out his legacy here. And you just bought your Dad a card for Father's Day. I don't take a lot of vacation. When I do, seminal figures tend to drop dead. Last year it was Jesse Helms. Tragic? Not so much. This year while I was slathering on sunscreen down by the shore, Ed McMahon coughed up his last guffaw, Farrah Fawcett truly became an angel and Michael Freakin' Jackson moonwalked off to another realm. I was sitting in a seaside bistro with my family, about to rip into a half pound burger I did not need, when my cell phone began to vibrate. 'In case you haven't heard,' the text read, 'Michael Jackson is dead.' HUH? A check with the chatty waitress confirmed it: the self-annointed King of Pop had indeed kicked it. What followed was a delicate dissertation on the Michael Jackson canon; one in which I danced around the Jesus Juice, the nose-melting surgery binges, the molestation charges, the cryogenic sleep chamber, the fact that he named one of his kids 'Blanket'... What I tried to convey to my two daughters was that that once upon a time the crazy white woman the Brits call 'Wacko-Jacko' was a young black man who just happened to be the most exciting entertainer on the planet. I was 15 when 'Thriller' came out. While not a typical Motown fan I was a follower of The Isley Brothers (thanks to my older bro's vinyl collection) and deeply enamored with MTV. Back then, Music Television was just that - a 24 hour cable channel that played incredibly new inventions called 'viddy-oze'. I was hooked. And while I couldn't identify with 'Billie Jean' and 'Beat It' quite like I could, say, 'Jack and Diane', even a rhythm-free bookworm like myself could not deny the infectious lure of the dude with the one white glove. Hell, for awhile he made high-waters cool! And while I may never have rocked a red sequined jacket, I damn sure bought 'Thriller' on cassette and danced to it in my room when I was sure no one was looking. If any other survivor of the 1980's tells you different, they're lying. But it didn't end there. Jackson released more hits, influenced just about everyone, then got deeply weird. I don't know much about that period. The last song/video of his I dug was 'Smooth Criminal' (and if you didn't like it, you ain't got a pulse). I do however know a thing or three about Elvis Presley. Like Michael, he was handed the globe on a silver platter at a very young age and - quite rightly - went out of his gourd. The day he died, I was ten. I still remember picking butter beans out behind my parent's trailer when my grandmother burst out of her home, housecoat a-flutter, yelling "Elvis Died!". 'That fat dude in the jumpsuits?' I asked. Over the next few hours, my elders educated me on the cultural signifigance of the hillbilly with the million dollar sneer. Slowly but surely, I became a fan. I couldn't help but think of that day as I explained to my kids how Michael Jackson broadened his appeal by tapping Eddie Van Halen to shred on 'Beat It'. I'm not sure they got it, but I have great faith they eventually will. Just because I'm picking bits of beach out of my teeth, doesn't the rest of the world is on holiday. In fact Alex Lindsay of the ProVideo Coalition has been quite busy building a shoulder mount rig for the new iPhone. Sure, it's nothing less than ridiculous - but the implications rank right up there with the buggy whip. Think about it: When every other resident of Earth is packin' a cell phone that shoots and uploads video to the web, do we really need legions of professional lenslingers with their laughably large dino-cams? Well ... yeah. Folks with user-friendly phone-cam in their pockets are still no match for a network of news cameras wielded by pros. After all, some idiot with an iPhone still can't craft the kind of b-block schlock I so specialize in. C'mon - can you even imagine some schlub turning a report on a school bus rodeo or a dog in a funny hat with a camera the size of a candybar? I think not. But here's the rub: The market for feel-good video fluff is - much to my chagrin - on the wane. No, it won't vanish overnight, but with news divisions dwindling, viewer habits collapsing and the twin tubes of the internet overtaking every aspect of communication, there just ain't alot of call for the waterskiing squirrel. But it isn't just silly features. No facet of broadcasting will remain unchanged by the revolution already in progress. A teetering economy, a tsunami of new tools, the ubiquity of the web ... it's the perfect recipe for a brand new paradigm. This ain't news, of course - but the advent of cellphones that's a TV camera and a TV set will no doubt be seen one day as a watershed moment. We're still not quite there yet, the iPhone's camera is reportedly clunky, but its ease of use and ability to instantly upload changes EVERYTHING. Looking forward to the next large plane crash, terrorist attack, Sasquatch invasion? Few of us are, but when that next unwanted schism occurs, don't wait for the networks to catch up. Go to the web, where the pictures, interviews and impressions will be scattered on-line before the first news anchor can get their dimpled chins on it.